Holding an event can be an effective way of gaining new business, but it can also be costly. To deliver a high ROI you need to make the most of your event. Many of your potential clients / customers will visit a number of events so to ensure you fulfil your business goals you’ll need to use every tool available so your event stands out. Including promotional products in your event plan can be a strategic way of increasing the impact of your event both on the day and in the weeks and months afterwards. As with any marketing activity remember to keep it simple. Firstly, identify your goals. It may seem obvious, but ensuring you match your goals to the promotional products you choose will make a big impact on the outcome. There are two important factors to consider, the event branding and the promotional products given out at the event. Choosing high-quality branding and merchandise throughout the event will help to create a positive, lasting impression. It can be easy to become paralysed by choice. For example, how do you know whether to use feather, standing or teardrop flags? 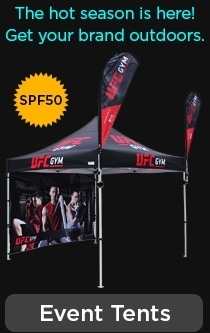 It is also difficult to know whether to choose a vinyl or polyester banner or invest in pull-up banners. Choosing a trusted supplier of promotional products will ensure you’re able to make the right choices which will have a positive effect on your target audience. At any event, it is important to send the attendee home with something, but selecting the right product can be challenging. Importantly, you want to ensure that whatever you give away is actually used and not discarded as soon as they leave the event. The more the product is used, the more the attendee will be reminded of your business which will ensure your event stays front-of-mind. A trusted supplier will be able to offer you advice and ensure the products you select are high quality and useful.